The Lake Erie Monsters announced today that defenseman Bruno Gervais (Pronounced ZHUR-vay) will be the team's captain for the 2014-15 season. Gervais, 30, is entering his 11th professional season, and his first with the Monsters. Also wearing letters on their sweaters for the Monsters this season will be alternate captains Andrew Agozzino, who is entering his third season with the Monsters, and veteran forward Ben Street. Gervais brings 418 games of National Hockey League experience to the Monsters blue line. Originally a sixth round draft choice of the New York Islanders in the 2003 NHL Entry Draft, Gervais has logged time with the Islanders, Tampa Bay Lightning, and Philadelphia Flyers during his professional career. Gervais also boasts 193 games at the AHL level. He began his professional career with Bridgeport in 2004-05, and skated most recently with the Adirondack Phantoms last season in the Flyers organization. In 2009-10 and 2010-11, Gervais was a New York Islander while current Monsters Head Coach Dean Chynoweth served as an assistant coach for the Islanders. "It's an honor to be named captain here, but it doesn't change the way I approach a game. It's a young team, and if I can help on and off the ice, I'll do that, " Gervais said. "We have a great core of leaders; it doesn't matter if you have a letter on your jersey or not. We have different kinds of leaders; some are quieter and some are more vocal, but it's all about getting the team together and the team as one." "The biggest thing is the experience. He has over 400 NHL games, he has played in the American League, and he's also a depth guy for Colorado who can go up if they have injuries. I think he'll be very good for our young group, " said Monsters Head Coach Dean Chynoweth. Agozzino has at least tied for the Monsters points lead in each of his first two professional seasons. After a 49-point campaign last season and a 52-point season the year before, Agozzino enters his third season in a Monsters uniform ranking among the top players in team history in several statistical categories. 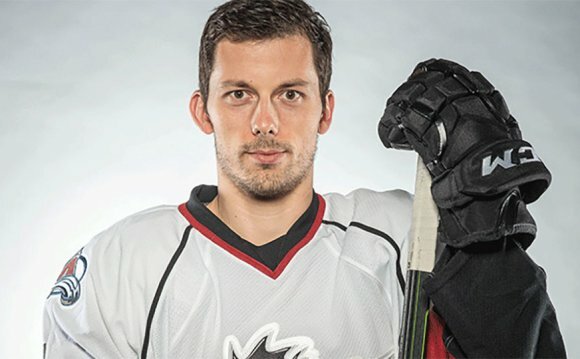 Agozzino is one of just five players to have amassed over 100 points in a Monsters uniform along with former Monsters T.J. Hensick, David van der Gulik, Mark Olver, and Ryan Stoa. Street, along with Agozzino, will also wear an 'A' on his jersey this season. Street was a part of the Calgary Flames organization over the last two seasons. In '13-14, Street tallied 28 goals and 60 points in just 58 games at the AHL level, and played in 13 games for the Flames. Overall, Street has 19 games of NHL experience. Street was a member of the 2006 National Championship team at the University of Wisconsin; his freshman season.